Over the past few months, the world has been gripped by a proliferation of crises—economic, geopolitical, social—erupting on a daily basis, interacting with each other, and raising the specter of a global calamity. On the economic front, international financial markets have swung wildly between massive gains and losses, as governments and central banks have sought desperately to counter the impact of a gathering slump in production and investment that threatens to topple the financial house of cards built up since the Wall Street crash of 2008. Seven years on, the marked slowdown in the Chinese economy is reverberating around the world, nowhere more so than in Asia where growth rates and exports are falling and currencies in countries such as Malaysia and Indonesia have hit their lowest levels since the 1997–98 Asian financial crises. This is corroborated by further evidence of the economic downturn in China is that the National Bureau of Statistics revised the figure of GDP growth in 2014 from 7.4 percent down to 7.3 percent—the lowest since 1990. The economy slowed even further in the first two quarters of this year—to 7.0 percent in line with official estimates. Many analysts, however, regard the official figures as overstated. Oxford Economics, for instance, estimates that Chinese growth at around 4 percent. 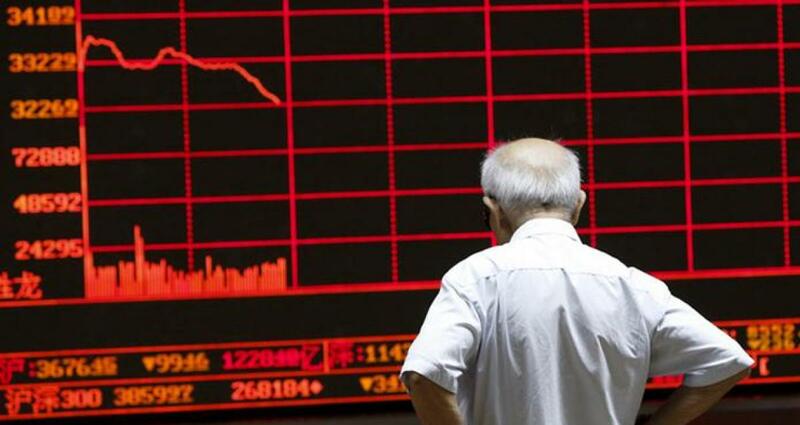 The slowdown in China is a product of the broader breakdown of the global economy. The frenetic levels of growth in China were an expression of the decay of world capitalism—the declining rate of profit in the advanced economies and the growth of financial de-stabilisation and parasitic speculation rather than production. Investment flooded into China transforming it into a huge cheap labour platform and boosting demand for commodities, parts and capital goods from Asia and around the world. The Chinese government only maintained high levels of growth following the 2008 global economic crisis with a massive injection of cheap credit and stimulus measures, which only fuelled frenzied speculation in property and shares that is now unraveling. Stagnation in Europe and Japan and slow levels of growth in the US translate into falling Chinese exports and manufacturing activity and consequently slowing demand for imports from the rest of the world. The economists analysed that “This slowdown means a major prop for world growth has been knocked away, especially as emerging markets comprise a bigger share of the world economy than they did 15 years ago and suggested that if Chinese growth was 4 percent then the overall growth figure for emerging markets in Asia and internationally could end up below 2 percent for 2015”. The Asian Development Bank in a recent update cut its growth forecast for developing Asia—which is higher than across global emerging economies—from 6.3 to 6.1 percent. For South East Asia, the figure fell from 4.9 to 4.3 percent, weighed down by lower than expected outcomes in Indonesia, Singapore and Thailand. Japan and South Korea including all of the Asian economies, developed economies, are heavily dependent on China. For most Asian economies, China is their largest trading partner. The present web of economic relations centred on China emerged in the wake of the 1997–98 Asian financial crises. The Asian “tigers,” which had exported directly to the US and other advanced economies, were integrated as suppliers for Chinese manufacturing. The proportion of exports from the rest of Asia to China has jumped from about 8 percent two decades ago to 13 percent. In the case of Indonesia and Malaysia, the figure has more than trebled. For Japan it shot up from 5 percent to 18 percent. The slowing global economy was reflected in the largest contraction in world trade since the 2008 global financial crisis for the first six months of this year—down 1.5 percent in the first quarter and 0.5 percent in the second quarter—according to the Netherlands Bureau for Economic Policy Analysis. Commodity exporters have been further hit by plunging commodity prices. The impact of declining exports has been compounded by growing uncertainty and turmoil in financial markets. These economic processes are sharply reflected across Asia, as indicated in the region’s largest economies. South Korea: Economic growth in the second quarter was just 2.2 percent. The country’s exports plunged by 14.7 percent in August, 2015, year-on-year, the biggest fall since the 2009, and eighth successive monthly decline. This August fall was “pretty serious” as South Korea had “long been a reliable bellwether” for global trade. Japan: The latest figures reveals that the Japanese economy, the world’s third largest, contracted in the second quarter by an annualised 1.2 percent with predictions that it will do the same in the third quarter. Exports to China, Japan’s largest export market, fell by 10.8 percent from January to June. Business investment fell by 3.6 percent in the second quarter. India: The economy expanded by 7 percent in the second quarter, fueled not by exports or investment, but a growth in consumer spending. CRISIL, a rating firm, forecast that private investment in 22 large industries will fall by 8 percent for the year ending next March. Australia: The latest official data revealed growth of just 0.2 percent in the second quarter, reflecting falling investment and exports. With coal and iron ore prices and volumes continuing to drop, the current account deficit blew out by 41 percent to $19 billion from $13.5 billion in the previous quarter. The Australian dollar is continuing to fall against the US dollar, reflecting the economy’s dependence on commodity exports. Indonesia: The largest South East Asian economy grew by just 4.7 percent in the second quarter, the slowest pace in six years. Exports declined with falling commodity exports to China. The value of the rupiah has hit its lowest level in 17 years amid fears about the country’s low level of foreign reserves. The Jakarta Composite Index has fallen 13 percent from 15 percent in April, another indicator of investor concern. South East Asia: Other countries are also being hit by falling exports leading to falling growth rates. Malaysia grew by just 4.9 percent in the second quarter with exports down by 3.7 percent, year-on-year, with falling demand from China for crude oil and palm oil. The ringgit is at its lowest level since 1997. Thailand expanded by 2.8 percent in the second quarter, propped up by a continuing influx of tourists. The Singapore’s economy was contracted sharply by 4 percent. The bleak picture across the region is being compounded by fears of a capital outflow should the US Federal Reserve begin to lift interest rates, as took place during the so-called “taper tantrum” in 2013. Far from leading growth in the global economy, questions are now being raised, prompted in particular by Indonesian and Malaysian currency volatility, about the prospect of a re-run of the 1997-98 Asian financial crises. However the economists warn that governments have equipped themselves well to fight the last war. A panic-driven crisis may not loom, but emerging-market currencies the world over have taken hits from low commodity prices, China’s slowdown and an impending American interest-rate hike. The economists’ cautioned that the emerging markets crisis bears many of the hallmarks of previous episodes. All emerging market crises start in the foreign exchange markets before making their way through others: commodities, debt, equity and finally the real economy. This one is no different. The remarks underscore the ongoing and worsening breakdown of capitalism since 2008. What is emerging in Asia is a crisis on a scale that will dwarf the economic and political turmoil of 1997–98 and for which there is no China waiting in the wings to pull the region out of the recessionary tendencies in world economy.